Alex has been busy! He has today’s Fireball puzzle and the New York Times puzzle. 69a, (IN)BOX [Where work piles up … with a hint to this puzzle’s theme]. 72a, (OUT)BOX [Where finished work goes … with a hint to this puzzle’s theme]. 11d, CUB SC(OUT) [One in a blue-and-yellow uniform]. 42d, SN(OUT)S [Features of tapirs]. This one came together relatively quickly for me, but it still has that nice layered aha of “Oh, this is an IN rebus!” and then “Oh, it’s an IN and OUT rebus!”. Elegant to always have the IN box come first, then the OUT box, and also elegant to have the two revealers stacked on top of each other (even if it produced the ugly LXX [70, in old Rome]). I really liked seeing YOU AGAIN?, MAITRE D’, and KEFIR. Elsewise, there was an unusual amount of ugly fill by AES’s standards in this one, which I found distracting: there was URSI on LLCS, ETRE in the NE to facilitate the Q/Z/J up there, OST, the aforementioned LXX. Very strange to have the bad partial KEMO crossing MIME when KENO/MINE (or even KETO diet / MITE) would’ve been a big improvement. Not sure why that happened. Solid Thursday offering. Until next time! It’s September! Better than pumpkin spice: the Fireball Crossword is back. (I know it was back last week, but the contests are Laura’s jam). This one felt like it took even longer than the digitally alliterative time posted. Once I figured out the theme, it fell a bit faster but there were a couple of clues that completely foxed me. The grid is 15×18 with an arrangement that seems unusual to me. I don’t think it makes a picture. Does it? First the theme: Take a word or phrase that ends in E. Find word or name ending in Q that can substitute for the E in a punny way. Clue accordingly. 17a [Answer to the question “Which brand of rum are we out of?”?] is WHAT’S DONE IS DON Q, from the base phrase “what’s done is done.” This would have been easier if I’d ever heard of DON Q. Nice touch: the crossing Q word is LIQUOR. 24d [Pluck out a root beer formulator’s eyebrow hairs?] is THREAD BARQ, from “threadbare.” I got THREAD right away and kept trying to get “A AND W” in there somewhere. 45d [Actor La Salle after being made a general?] is BRASS ERIQ from “brasserie.” This time I knew the actor but could not figure out the base word for a looong time. I kept trying to see “brass ring” but when I finally figured out the Q for E swap, the light dawned. 70a [Sizing up “Party of Five” actress Paula?] is MEASURING DEVICQ from “measuring device.” Never watched the show, never heard of the actor. (Many women prefer “actor” and I use it by default unless the performer herself chooses the word “actress.”) My unfamiliarity with the names in the two 15-letter entries made for long, hard solve. It was worth it, though. This is one of those puzzles that is both a feat of construction (all those Qs!) and a lot of fun to solve. Some of the crossing Q words are crosswordese or roll-your-own (I’m looking at you, ET SEQ and QUOS) and I really don’t care. This is an ORCA contender. I’m not sure if ANODE crossing ANION counts as an etymological dupe. It surprised me. The last answer I filled in was 11d [Major in June]. I kept thinking it was a college major or an army major, neither of which made any sense. It’s a golf major: the US OPEN. Duh. 39d [Looks] stopped me because it’s not a verb. It’s a noun: MIENS. 74a [Unicycle on the highway?] is a SIDECAR. I don’t fully understand it, and it made me laugh anyway. Whew! That was a workout. I could not sort this one out for a long time. It didn’t help that I had the entire northwest of the grid filled in without even a whiff of what the theme might be (because there isn’t anything thematic in that corner, except for POL which I thought just had a bad clue). I had huge gaps of white space all over the place due to the theme, tough cluing, and some rough fill. Finally, I stared DIAL TONES into submission at 8d, and that broke open that corner and led to the theme answer at 18a. The theme is LANDSLIDE (19d, [Decisive victory, and any of four features of this puzzle]). Each of the four main theme answers ends with -LAND, but those letters slide down and to the right. 27a [Its national anthem is “Mazurek Dbrowskiego”] POLAND. I really should have figured it out with this entry. 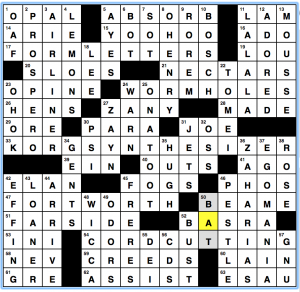 But I thought the clue was just missing an “Abbr.” or similar. 45a [Cork setting] IRELAND. 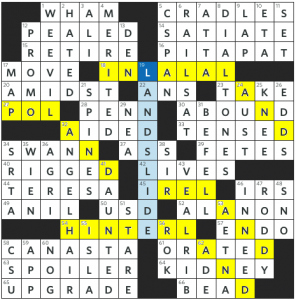 This one was evil because we’ve all filled in EIRE or ERIN for IRELAND in countless puzzles, and the four squares allotted to this answer seemed to want one of those two words. 54a [Sticks] HIINTERLAND. Love this word, but for a while, this entry looked like HIsToRy, though it didn’t make sense with the clue. This was a wonderful theme that made completing this grid a good challenge, just what you want toward the end of the week. My a-ha moment was long-delayed but very satisfying. 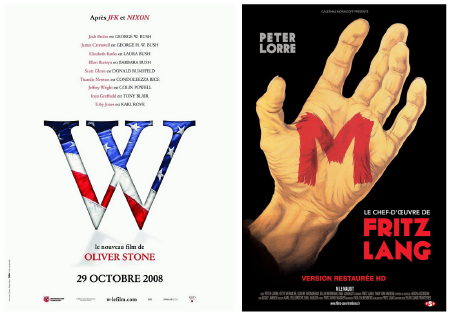 My only gripe with the theme is the inconsistency in having two countries, and two non-countries. But at least they are sort-of symmetrical in the grid. A few things take away from the fun though, things like the crossing of uncommon proper names (in foreign languages no less) and a healthy dose of crosswordese. No doubt filling this grid was a challenge because of all the triple-checked squares. But I’m starting to nitpick. In the end, once you include the sparkly long fill answers of DIAL TONES, ANGEL HAIR, PIT-A-PAT, and CANASTA, and the challenge of the theme itself, you can count this one in the win column. 3.7 stars from me. Playing with the OR in the middle of FORM, WORM, KORG, FORT, and CORD makes for some fun here. I don’t know what “Adularescent” means but I figured it’s something that applies to OPALs. ONATOOT? ON A TOOT? I don’t get that one for “Getting blitzed”. A bit of a stealth theme today. At first, I noticed the repeated TTER letters, but then CIGARETTEBURN showed up and put a spoke in the works. Turns out it’s the old “scrambled letters spanned across two parts of a word” trick. 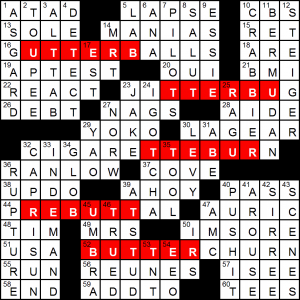 The letters are BUTTER, as explained in the cryptic-style revealer BUTTERCHURN. You have to CHURN the letters in BUTTER. [Rolls off the alley], GUTTERBALLS. The clueing is peculiar. Either GUTTERBALLS is clued as a verb here, or Rolls is used as a noun. I think it’s trying to be clever, but the clue is just jarring either way. [Open event gold medalist in the 2016 Chess Olympiad] is a really long way to go to get to USA! [Window-switching keyboard shortcut], ALTTAB. I use this all the time. It’s very handy. If at least one person who didn’t know about it discovers its utility, this clue has done its job! This entry was posted in Daily Puzzles and tagged Alex Eaton-Salners, Brendan Emmett Quigley, Frank Virzi, Joe Deeney. Bookmark the permalink. Nice Thursday. The “shell” realization was my biggest aha. 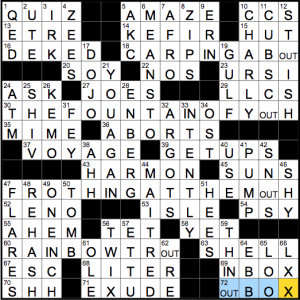 NYT – Didn’t find this puzzle too hard, and the rebuses were fun but wow! For me, that NW crossing of QED and DEKED was rough. This was a lovely Thursday, fun to solve. As Amy said, the positioning of the IN- and OUTBOXes was clever and satisfying. I also liked the clue for SHELL. And it was fun to have been consuming KEFIR while doing the puzzle. 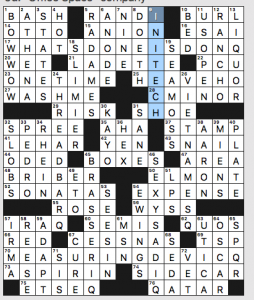 Pretty clever theme in the NYT puzzle. A little bit of a retro feel to the revealers – I suspect that for most of us, our INBOX is where messages accumulate, and few of us have an OUTBOX anymore. As usual, I was slow to pick up on the rebus. I didn’t see CARPING ABOUT, and was missing too many crosses to be suspicious. Then, FOUNTAIN OF YOUTH fit perfectly at 30-A. Caught on when I remembered the CUB SCOUTs’ colors. Do people know what “kefir” is? I did not, and did not know AKC either, so I ended up running the alphabet at that square. Enjoyed the rest of the puzzle. That’s funny — I thought kefir was something the hip and earthy types of today drink. I was young in the 70s but neither hip nor earthy, and I don’t remember seeing or hearing about kefir then. I am a lactophobe, in any case. I also think of it as a 70s earthy-crunchy thing – precisely today’s kombucha although the people drinking it were scruffier. Oh, but the trick was so good. I loved this puzzle. I wonder if IREL was the seed, because, as noted, we all must have confidently plugged in EIRE or ERIN before the WTF moment hit. I am grateful for any Thursday NYT crosswords I can solve without help and this one was one of them.